Here is a list of our 2 year old fruit trees “bare roots” selection for Fall 2018 – spring 2019. Visit here for instructions on how to plant and care for your bare root fruit tree. Fuji Red Sport : Late October, excellent eating apple, stores well. Royal Gala : late summer apple. Hardy, vigorous tree. Firm, red apple. Golden Gala: mid season, firm and sweet. Extremely crisp. Red Gravenstein : Firm juicy with tart flavor. King : large, red striped. Used for dessert, cooking and cider. Golden Reinette : Medium apple with a fresh, crisp, juicy flavor. Golden Russet : flesh is tart, sweet. Suitable for cider. Red Northern Spy: best winter apple, late season. Red and hardy. Honeycrisp : large round apple, very crisp and juicy. Excellent keeper. Yellow Transparent: Green cooking apple. Hardy. Spartan: Heavy producer. Dark red fruit, juicy and crisp. Eat fresh or cooked. Florina : European scab free, matures mid-October. Red apple. Liberty : similar to Spartan, scab and mildew resistant. Columnar, Golden sentinel : scab resistant. Late august. Columnar, Scarlet sentinel : Compact columnar apple. Late Oct.
Columnar, Macintosch: very hardy. Fruit is medium to large, red color. 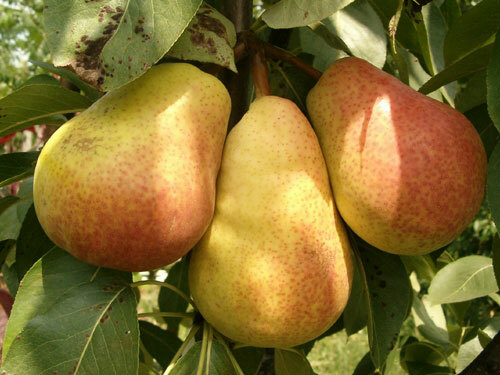 Bartlett : medium large fruit, green when picked, bright yellow when ripe. Flemish Beauty : Dwarf, vigorous and productive. Large fruit, blushed, juicy. Bosc : Fruit is medium large, heavily russeted. Juicy and very sweet . Highland : outstanding winter pear. Yellow, juicy and sweet. Red Sensation : Red Bartlett, late summer. Spartlett : Large fruit, yellow when ripe. Fresh eating or canning. Clapp’s Favorite : fresh eating, large fruits with yellow skin and a red cheek. Compact Stella : Early, heavy crops of black heart shaped fruit. Lapins : Resistant to cracking, large fruit. Bing : Deep dark red/black fruit, firm and juicy. Requires pollinator. Sweetheart: Bright red, large fruit. Very productive. Late July. Rainier : Large, yellow cherry with red blush. Delicate flavor. Need pollinator. Redgold : large, glossy, highly colored fruit with firm and juicy, freestone flesh. Champion : sweet and flavorful, good for coastal areas. Le borgeot : Pear flavor. Great for jams and jellies. Some fruit trees are semi or full self-fertile, but most need a pollinator to produce a heavy fruit crop. A pollinator is another variety with a flower season that overlaps the variety in question and produces adequate pollen. Many urban areas have enough existing fruit trees so pollination is never a problem. If there are none nearby, it is necessary to plant pollinators. We do our best to source quality trees, refunds on bare roots are, unfortunately, not available. Trees subject to availability.